Aleppo has been retaken by Bashar al-Assad’s forces, and it appears he has won the four year long Syrian conflict with the help of Vladimir Putin and the Russian Air Force, despite considerable resistance from Barack Hussein, who has pretended to be fighting terrorists while doing all he can to help them. 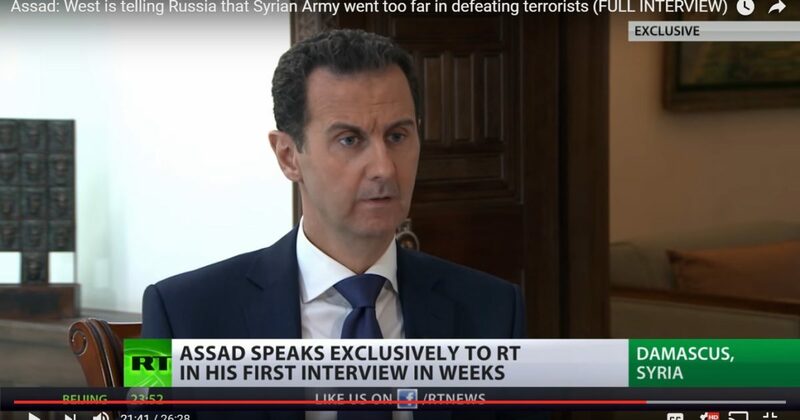 In an interview with RT, Syrian President Assad warned against taking statements by western governments at face value, as in Aleppo, where the US seemed to care more about saving terrorists than civilians. Putin is right in this conflict for supporting Assad, and our very own president, Barack Hussein, is flat out wrong for defending the terrorists who are causing such widespread misery! Assad has been a secular leader who has defended large Christian and Jewish populations, which have lived peacefully with Muslims in Syria for centuries.